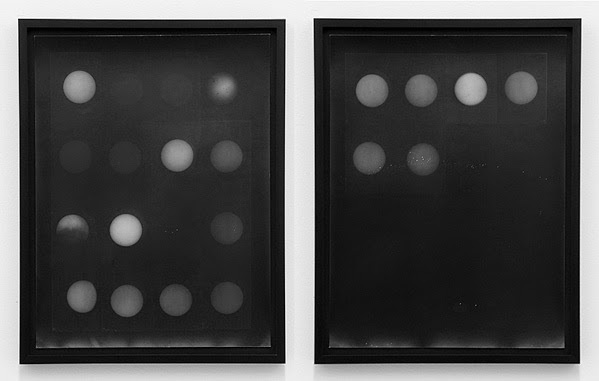 "The Sun 1957 is the collective title of 25 silver gelatin prints that depict the Sun from a mid-century international survey of sunspots. Finding the film negatives separated from contextualizing logbooks and labeled only by month and the year 1957, I loosely followed this organizing principle by making contact prints of the negatives in grids. 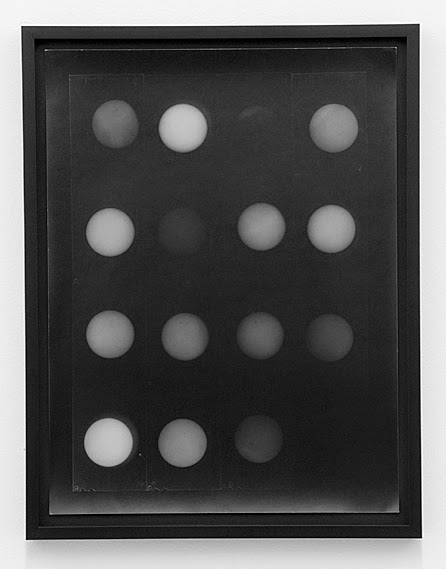 The prints were all made onsite using vintage paper (11.5” x 15.5”) that I found in the darkroom, and the unpredictability of the expired paper resulted in splotches and artifacts on the print surface that call to mind the sunspots themselves. The prints are assembled chronologically by month into a larger grid to formally suggest the shape and structure of a calendar. The internal logic of such a calendar creates an encompassing yet mysterious picture of the Sun for that year. Some months are represented by numerous negatives (and therefore prints) while other months are recorded by far fewer images. There is no record of November."